The object of a PLC simulator is to 'fake out' the input into a PLC so that the programmer can test and debug the program before installation into it's operating environment. Our patent pending PLC simulators achieve this by mounting on the existing terminal strip of the PLC card and providing easy controls to turn digital inputs on/off or adjust analog signals. If you are a engineer who programs PLCs or even a technician in need of a quick way to test a PLC functionality then these devices are for you. Save time, money and embarrassment by fixing problems before they start. These PLC simulators are for sale in our products section. The customized adapter mount for the Allen Bradley card (part number DI-16-ABSLC500). The general digital input card that plugs into the mount (part number DI-8). Since this is a 16 input card we'll need two of these. Plug these units into the mount connected to the card. Attach the mount to the digital input card by unscrewing each terminal and sliding the posts into the matching terminals. Now tighten each terminal. Plug each of the digital simulator cards into the mount. With power off, connect 12/24VDC to IN and ground to COM on each digital simulator card. Reverse this for sourcing cards. Turn on the voltage. Now each switch controls one input into the card. Easy mounting means no messy rats nest of wires. Small compact boards mean no big expensive boxes with switches and knobs everywhere. Easily transported to other PLCs. Easily interchanged between different PLC manufacturers. Testing is done using the actual equipment not with software simulation or replacement simulation cards. Save money over software simulation. The digitial input simulator installed on an Allen Bradley SCL500 PLC. The analog simulator mounts onto the PLC card in the same way but this time there are dials to adjust the voltage into the card. Submitted by PLC Simulator (not verified) on Sat, 2012-07-28 09:17. 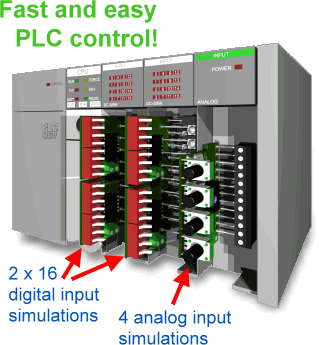 I am about to add your PLC simulator pic/link to our PLC Simulator Pinterest board. hope that is ok, and the extra traffic helps others find this great product of yours.